From Washington, Kyler Whitlow got a great graduation present before heading to college next month. He came down with long-time amigo, Mike Whitlow, Kyler’s stepdad who also happens to be a pro-bass fisherman. They had a great week and we enjoyed them both! Something to crow about! Big rooster for Larry Barnard from El Segundo CA who rocked this big rooster and did C.P.R. on it (catch…photo…release). Nicely done. He got several. 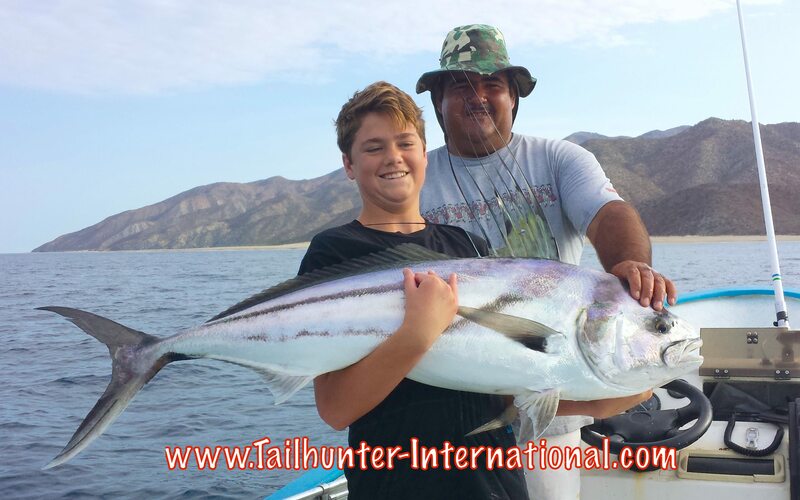 You gotta love Rebecca Jennings’ facial expression as Captain Luis hoist the biggest dorado of the week for her! 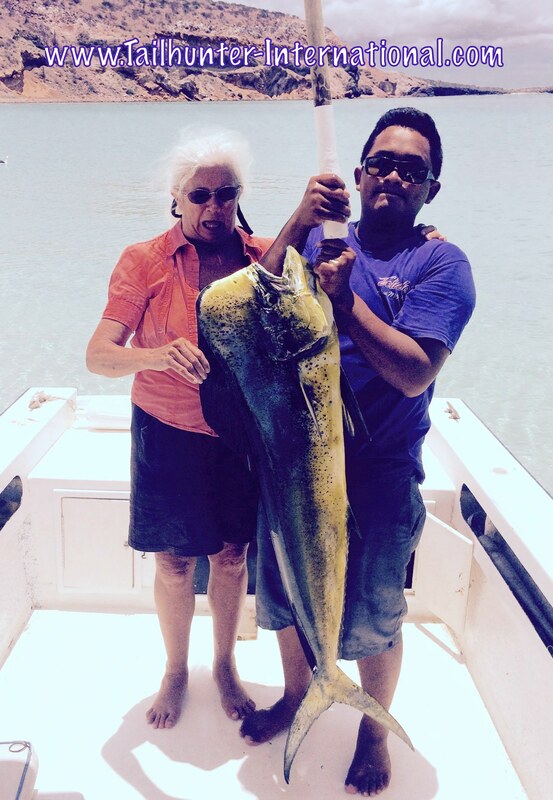 The big mahi was estimated between 35-40 pounds. Rebecca visits us every year from Arkansas. I know this is a BIG fish because Chris Barnard is a BIG GUY! Flat seas…sunshine…and big roosters! A good day. Caught and released! This amiga can hang with the best of them! Wendy Ralston from Washington fished hard all week and out-fished many of the guys. 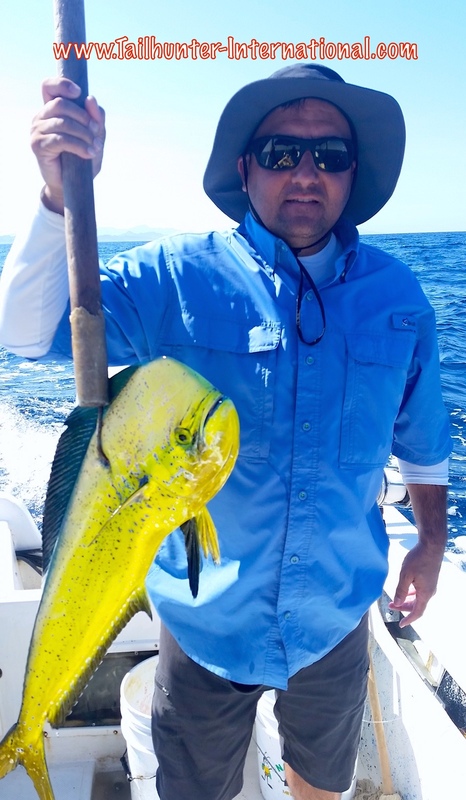 Check out this nice mahi from La Paz. Our “TEAM PROFESSOR.” Two of our favorites have been visiting us for years. Professor Mark Marcus now lives in Tennessee and Professor Llew Williams now calls Florida home. 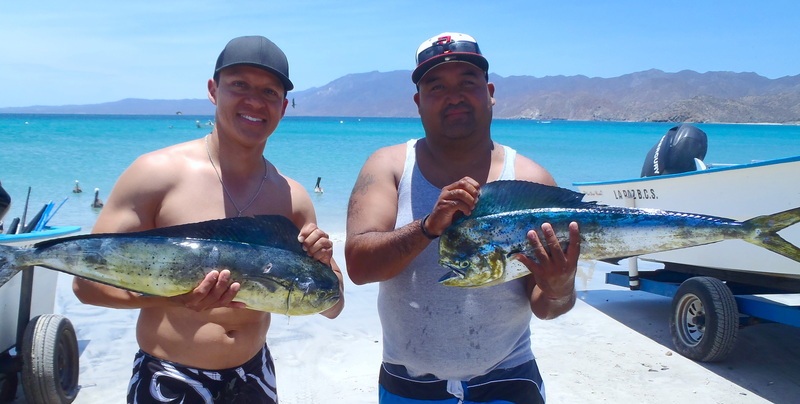 They got a nice rack of dorado and a pargo fishing out’ve Bahia de Los Muertos. 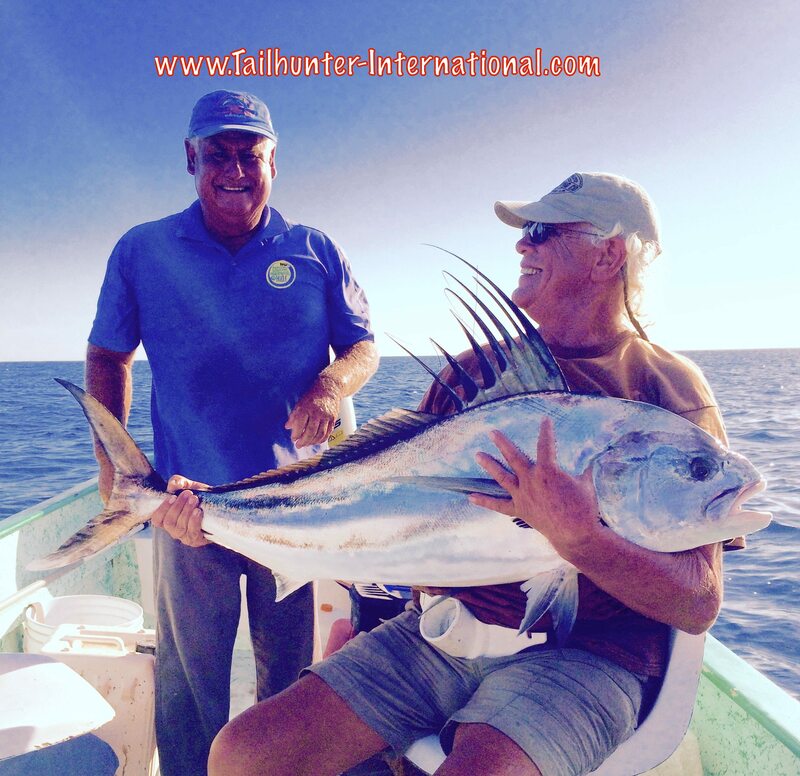 This is a great shot of Captain Archangel having a laugh with Mike Majors and Mike’s big roosterfish. Mike’s from Arkansas and he released this nice gallo. 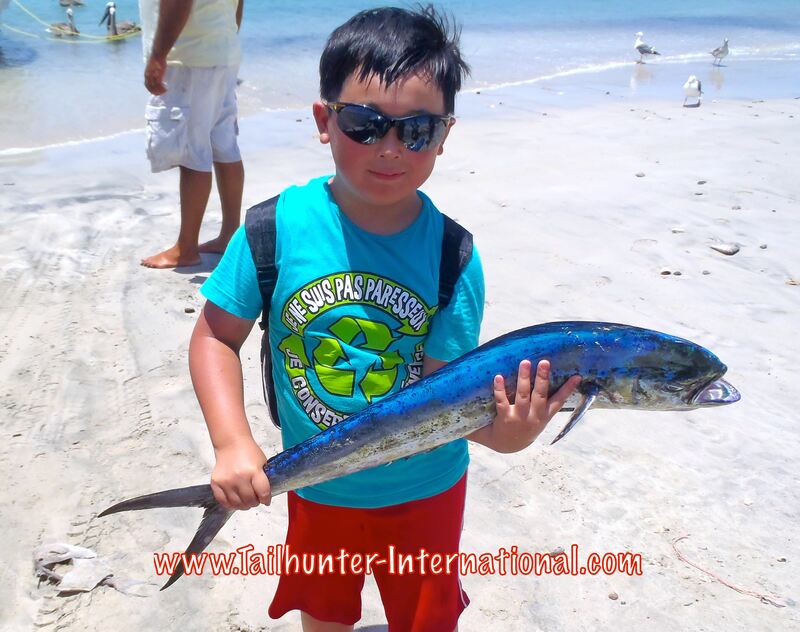 Nothing like starting ’em early and these school-sized dorado are perfect for the family! 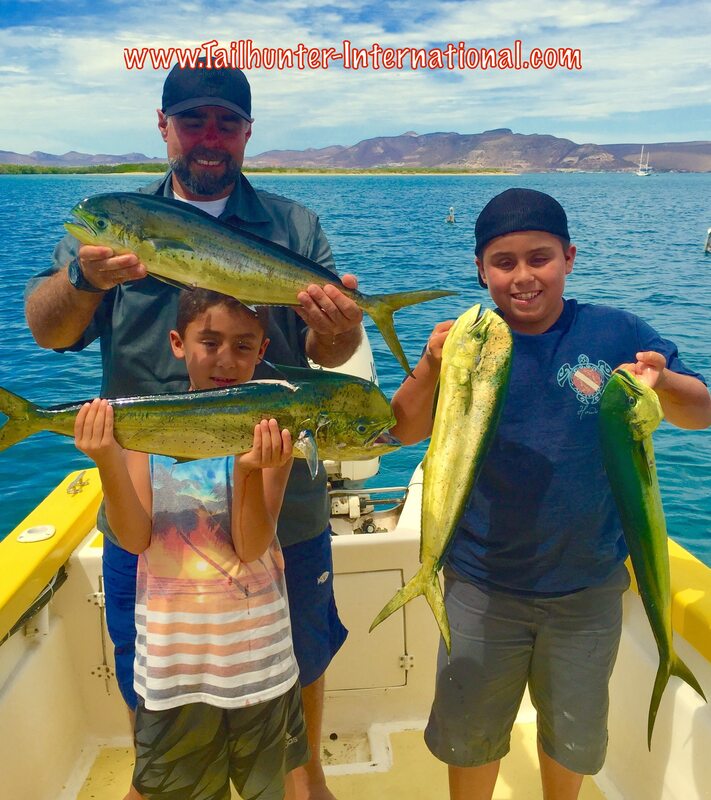 John Ungaro from San Pedro CA had two days on the water and shows off some of their dorado with boys Nicholas and younger John Raul. Don’t let the size fool you. Pargo are some of the toughest fish to nail out’ve the rocks and they get much bigger, but even tougher on light tackle and Wade Ralston from Washington is a light tackle specialist. 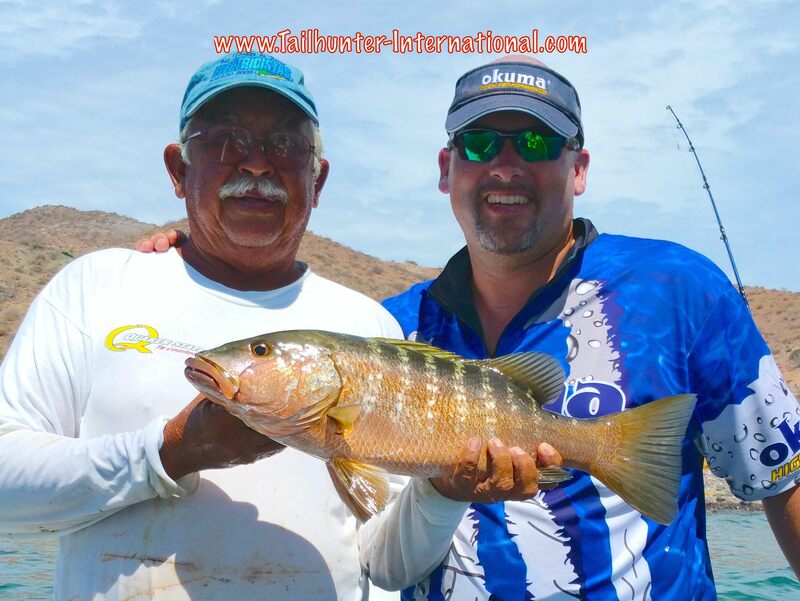 I think he must have gotten about 10 different species all week on light tackle and is shown here with Captain Raul. I might have to frame this photo! I don’t have many photos of popular Captain Boli giving off a good belly-laugh but he and our amigo, John Olson recently retired from a career with Disney, got into a school of small jacks and roosters and had themselves a ball. Tough kid! Aristotle Chang from Vancouver, Canada got a 450 pound marlin last year with his dad. Nothing quite so big this year, but he had fun with dorado and big bonito. 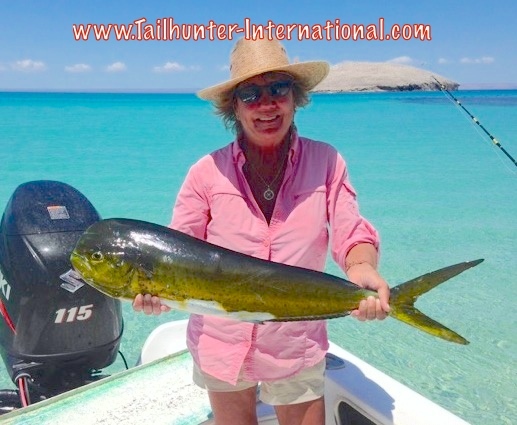 Katie Olson with another dorado and a picture-postcard photo after a day of fishing with out Tailhunter La Paz fleet. Always good to have her and husband, John, visiting us. I promised Alex Trasvina that I would post his photo with Mario Ayala from Chula Vista CA on this week’s report with their dorado. So…there you go, Alex! Thanks!!! 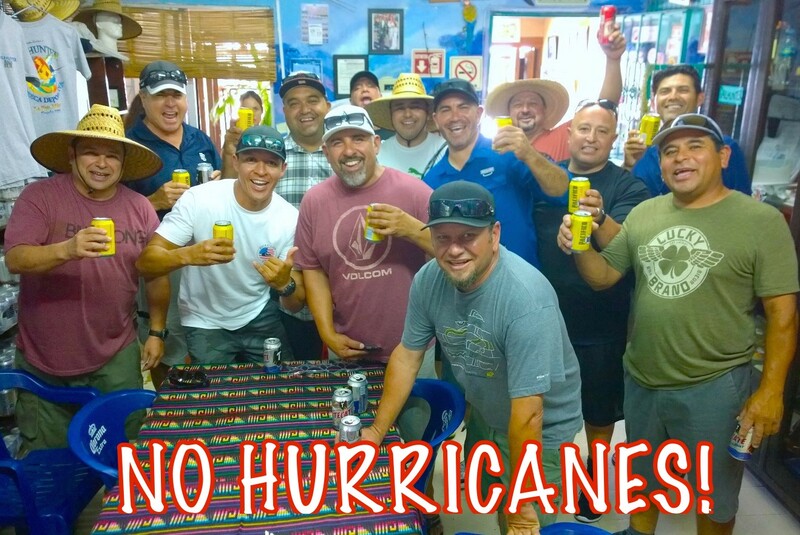 Our buddy, Alex Trasvina from San Diego (white shirt in front) always brings a fun group of guys every year, but last year they showed up just as a hurricane broke on our heads and we all had to come back and cancel all the fishing. But this year…all went smooth so we toasted a bunch of beer in the Tailhunter store! Shout outs to Mike and Diane Shyrock from Washington who came down with a bunch of great stuff for the kids and Jill’s “Pack for a Purpose” program. Thanks to you both for the big hearts! I’ve known Ken Chaplin from Oregon for many years as Ken is a S. African hunting outfitter. He got to finally bring his son, Dustin, down to get some fishing in but packed a few ice chests with clothes, school supplies and sporting goods for the kids! Wow! BIG ROOSTERS and DORADO BEND RODS! Bait continues to be a problem. Quite honestly, unless you’re chasing billfish or bonito and maybe a few dorado, there’s not much else going on. Of course, this could change any day! That’s just the way it is here. Dorado are leading the charge. Limits or near limits for most of our fishermen most days. Some days coming back early. But good steady action. Dorado seem to be getting bigger each week. Fewer sinks and better 10-15 pounders (still small by our standards) but some larger 20-30 pounders getting hooked and occasionally brought in. Billfish also around as well. Inshore, some decent pargo and cabrilla fishing still available as well for those with the patience and hand-eye coordination to pull them outta the rocks! Show -and-tell! When 15-year-old, Brett Vitale from San Diego goes back to school, he might have at least one pretty good story to tell! 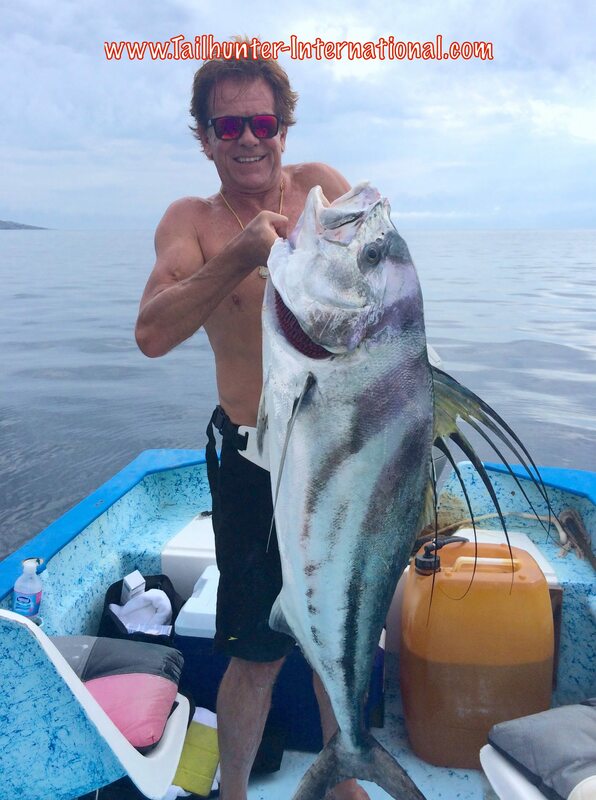 With Captain Gerardo, he tore it up with this big time roosterfish that he caught and released! Same day, his brother caught a 180 pound blue marlin. Flyrod grins for Randy Skedgel , who has citrus farms in Central California. 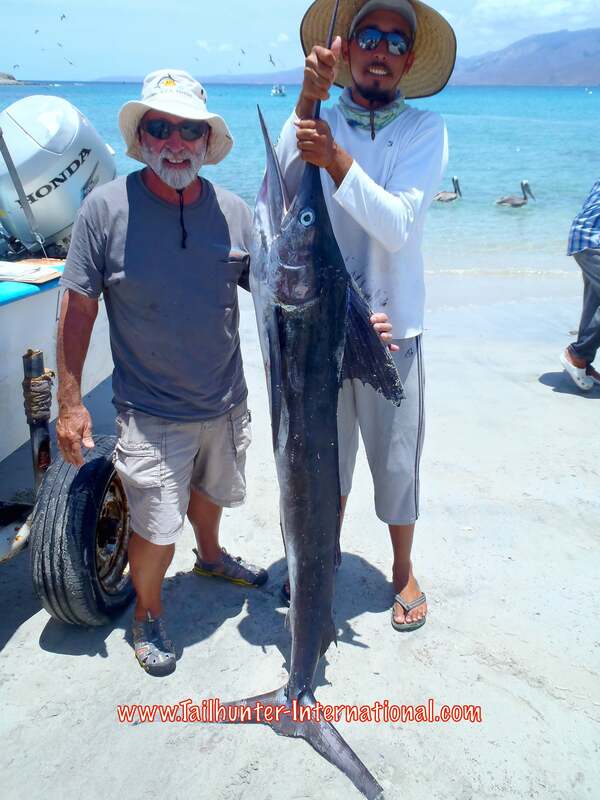 Randy had a great week on the flyrod with dorado, roosterfish, cabrilla, pargo, and even a wahoo. San Luis Obispo in the house with 3 big dorado days for Bill White and Mark Davis holding up a pair of young bull dorado! Two of our long-time best amigos, Barry Wood and Mike Kelly, from Orange Co. California with some great eats! 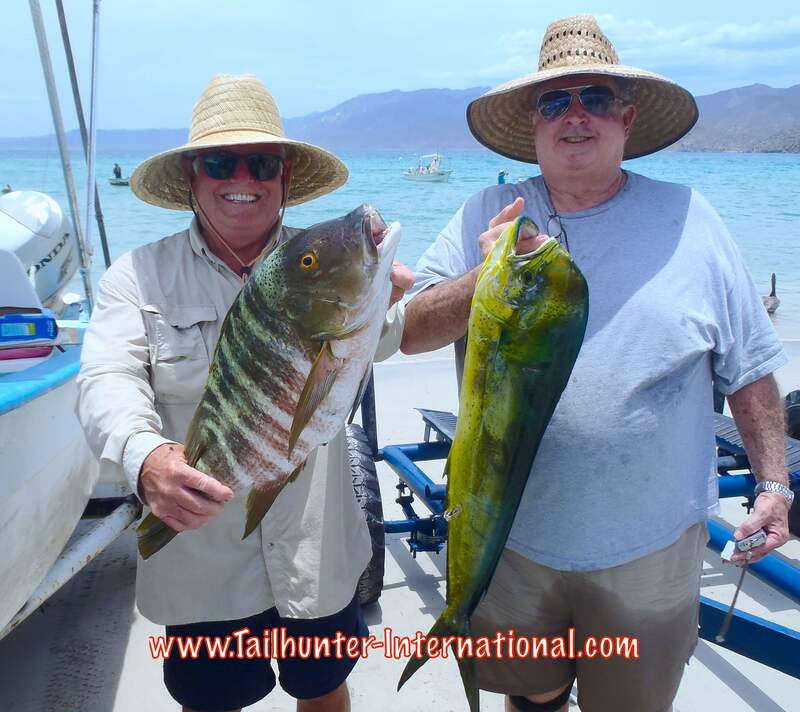 Barry is holding a prized pargo mulatto (barred pargo) and Mike is holding a bull dorado. Thanks to them as well for bringing a bunch of stuff for the kids and also some chocolate for Jill!!! 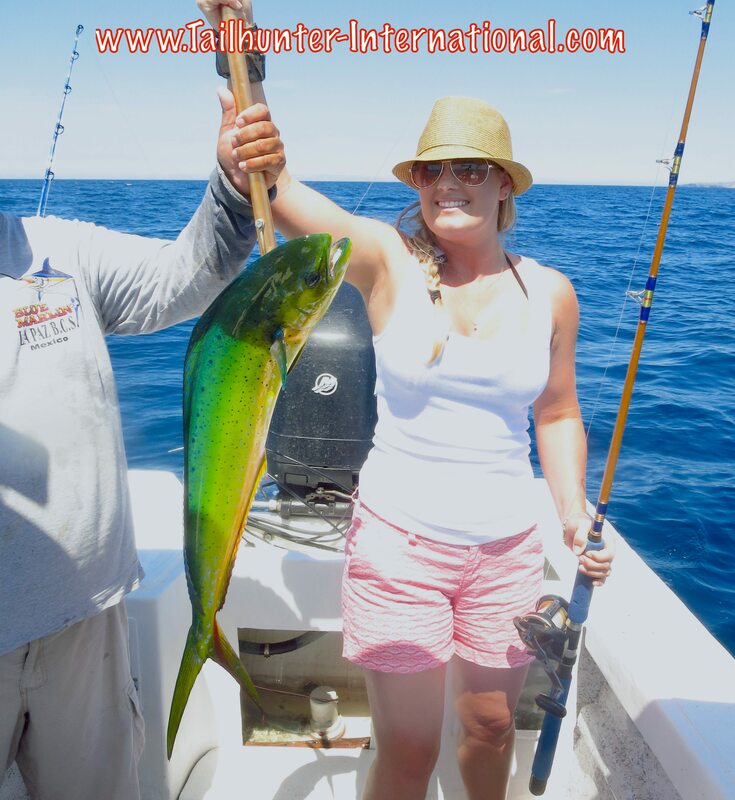 Andrea Reynolds from San Luis Obispo came for a week of diving with us, but took a few days for fishing and had a big smile with Captain Rogelio and another dorado in the boat. Fire Captain Dave Castanon from La Verne CA has been fishing with us from the beginning! It’s always great to see him and his family. Dave has his fingers in the gills for a couple of nice dorado. Good week for marlin. Jose Lopez and his dad, Sal, hold up a striper they took off Las Arenas on a bait. The fish was not able to be released and they donated good chunks of meat. First timer, Dane Mrazek from the Sacrament CA area had himself a crazy week with limits or dorado every single day for 5 days! He’s got a nice pair here posing on the beach at Balandra! No doubt about it, an odd-sort of week for fishing. Much of the week was spent watching the weather websites and satellite images wondering how Hurricane Dolores was going to unfold. Or not. You just never can tell. Early on, it looked ominous as the storm developed and made it’s way north gathering power. We cringed a bit as this was one of our busiest weeks with a full house of fishermen, divers and families. Early predictions has as much as 4 days of rain coming down on us. Sure we need the rain, but we surely don’t need it in hurricane force and surely not ruining vacations. So, there was alot of trepidation and anxiety about it. However, as the week went on, Dolores veered out and north. Thankfully. I’m sure up the Pacific Coast, surfers were ecstatic. For us, it was a mixed bag. We ended up with a few windy and bumpy days, especially for our Las Arenas anglers and then we had about 30 minutes of hard rain followed by some intermittent showers on Friday. And that was it. More or less. Still beats a full-fledged hurricane! Really poor fishing this past week. I think the epic historic wahoo bite of 2015 is officially dead and gone. It’s been an incredible two months. There’s still a few fish out there, but we only hooked one this week. Bait has been an issue. Once again, like last week, there’s big fish…or there’s nothing. That meant some good action on marlin…blues…blacks and sailfish. Or big rooster fish. And that was pretty much it. The rest of the catch was triggerfish and bonito and an occasional dorado. By the latter part of the week, wind and waves generated by Hurricane Dolores to the south made it pretty rugged to fish. It as pretty ugly. That didn’t help much. Which is also why it’s a good thing we have two fleets…so we can move folks around to where conditions and fishing are better. There were a few rough days as Hurricane Dolores got closer, but for the most part, other than some bump and a little rain for less than an hour, this is where all the action was happening. The nice thing about us having our two fleets is that when one side isn’t happening like the way Las Arenas was scratchy this week, we were able to move lots of our clients to our La Paz fleet and get into some good action. 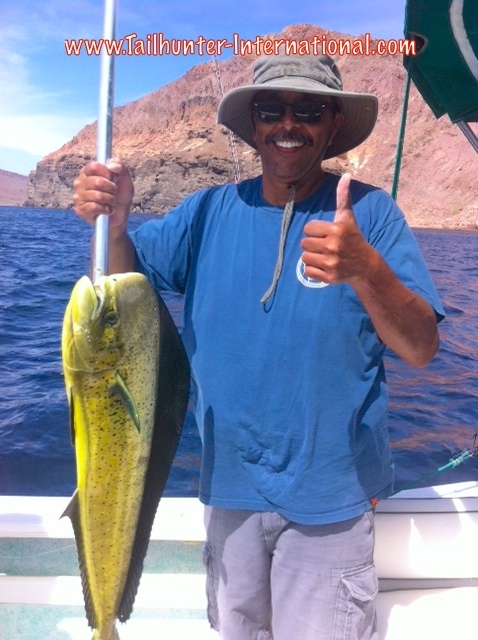 Truthfully, still ALOT of smaller dorado…under 10 pounds. But crazy good action mostly! Some days catch and release as fast as you could go. 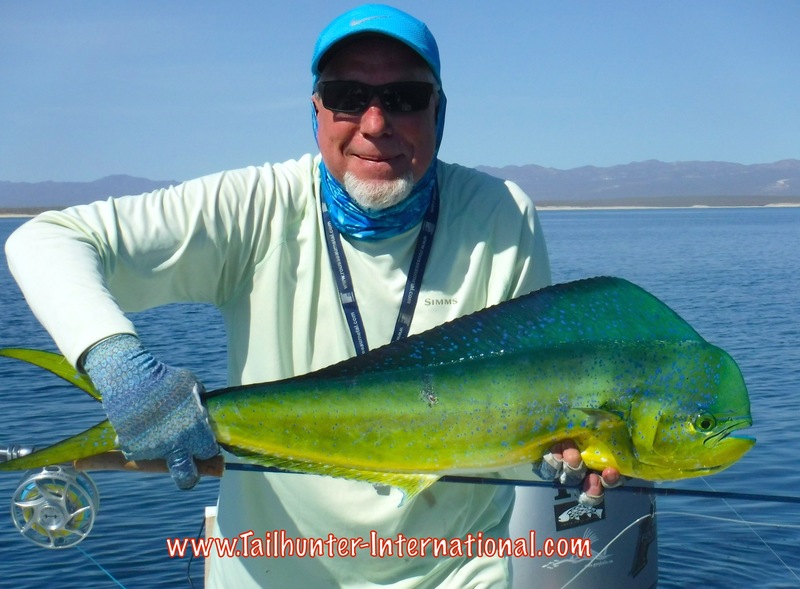 A few days some of the boats were back before lunch with limits of dorado and having released another limit or two. Great light tackle stuff. 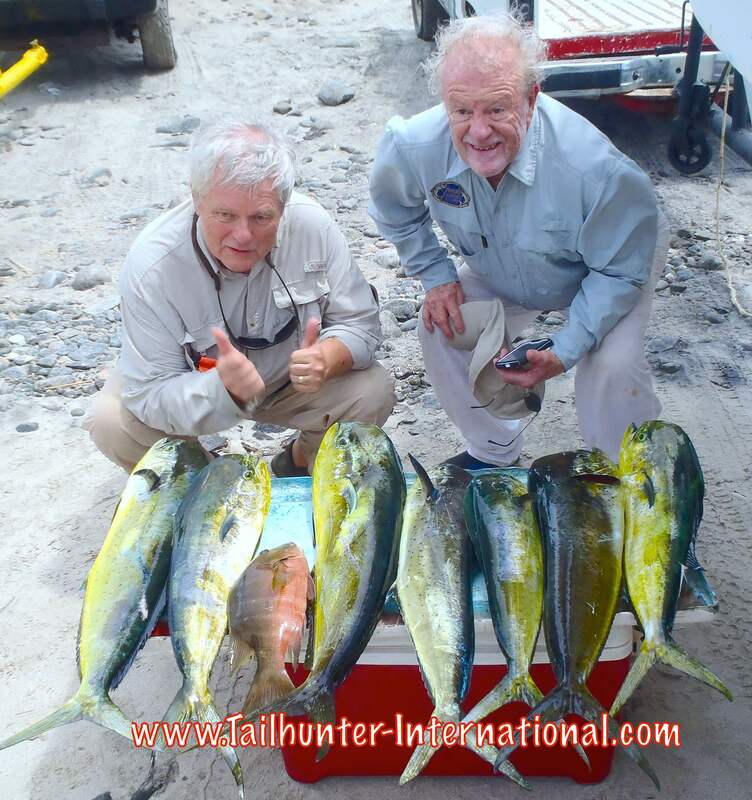 Also, some of the larger dorado started to mix in with some 15-30 pound bulls getting hooked. Fishing got better as the week went on. Additionally, a few striped marlin and sails hooked every day as well as blue and hammerhead sharks plus a blue marlin as well. Pargo, triggers, cabrilla and rooster fish inshore to give some variety. Just a head’s up…no hurricanes on the radar, but early predictions are showing maybe some thundershowers mid-week! Our “Pack for a Purpose” program keeps rolling along and has been such a success now for almost 2 years. 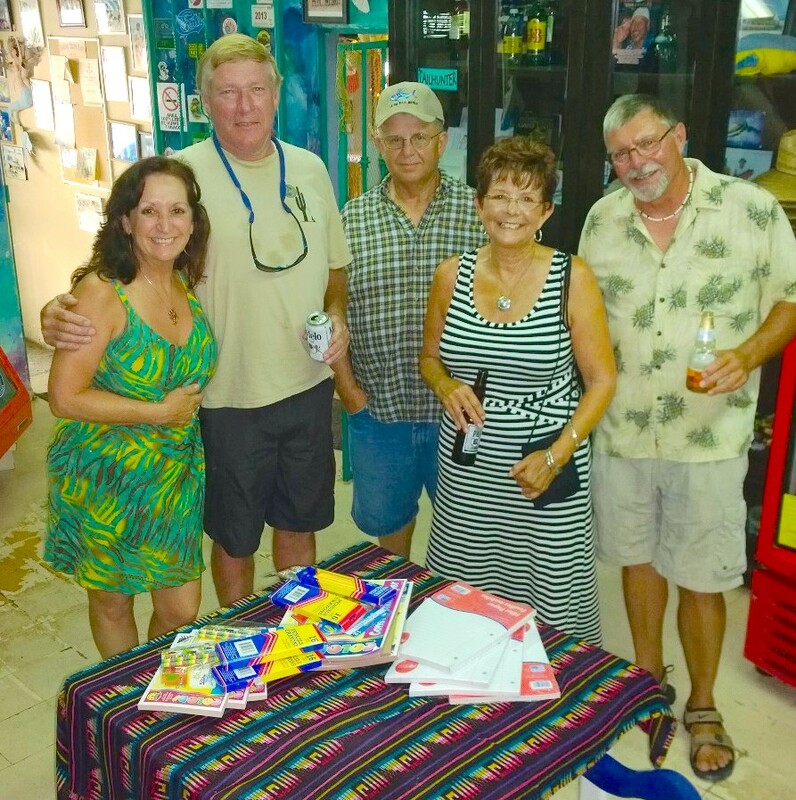 Another big shout-out on behalf of the Battered Women’s Shelter and the FANLAP orphanages to our generous amigos who filled up their empty coolers on the way down and brought much-needed things for Jill’s charities. Hugs to all of you! Enough to start a school! Rebecca Jennings (Arkansas), Wade and Wendy Ralston (WA), our own Jilly, Mike and Kyler Whitlow (WA) and Mike Majors (Arkansas) standing with bags and bags of donations for the kids! 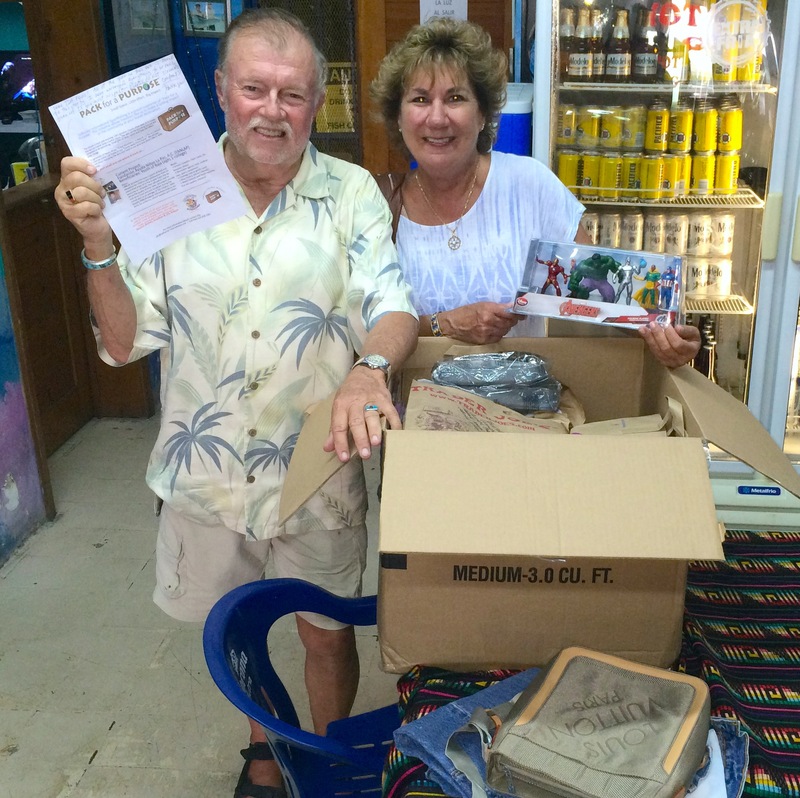 Just retired from a zillion years working for Disney all over the world, John and Katie Olson paid to have a huge box of toys and other incredible goods shipped down with them to donate to Pack for a Purpose! Two of our best! 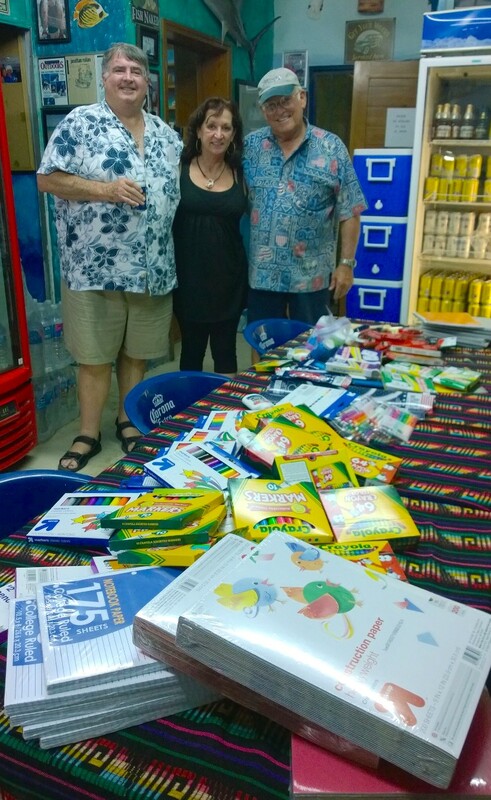 Mike Kelly and Barry Wood, flank Jilly with a table load of school supplies they packed down as donations! Big hearts from Oregon standing with Jilly…Gary, Bob, Jo and Phil always come visit us and we’re grateful! Cheers! Two professors in the house! Mark Marcus (Tennessee) and Llew Williams (Florida) are retired college professors and long-time friends. 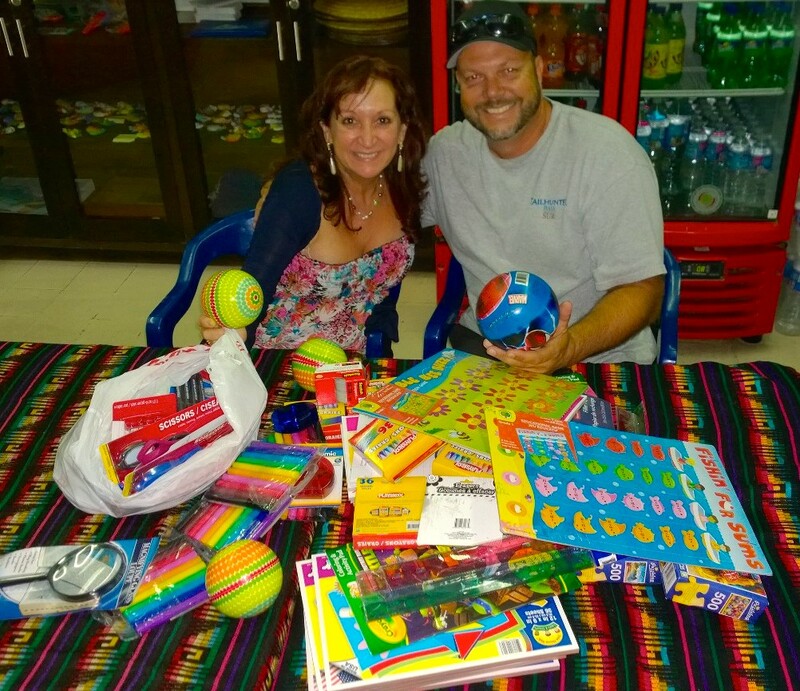 Balls…hats…schools supplies and toys for the kids! Always great to seen them! 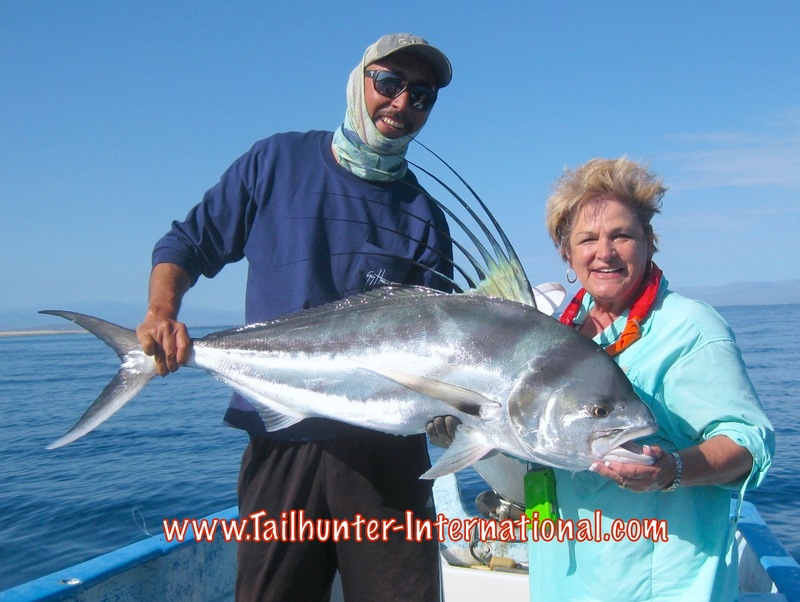 Amiga from Colorado, Dolores Ehlers has been coming to see us in La Paz for years and finally got to cross off a roosterfish from her bucket list. 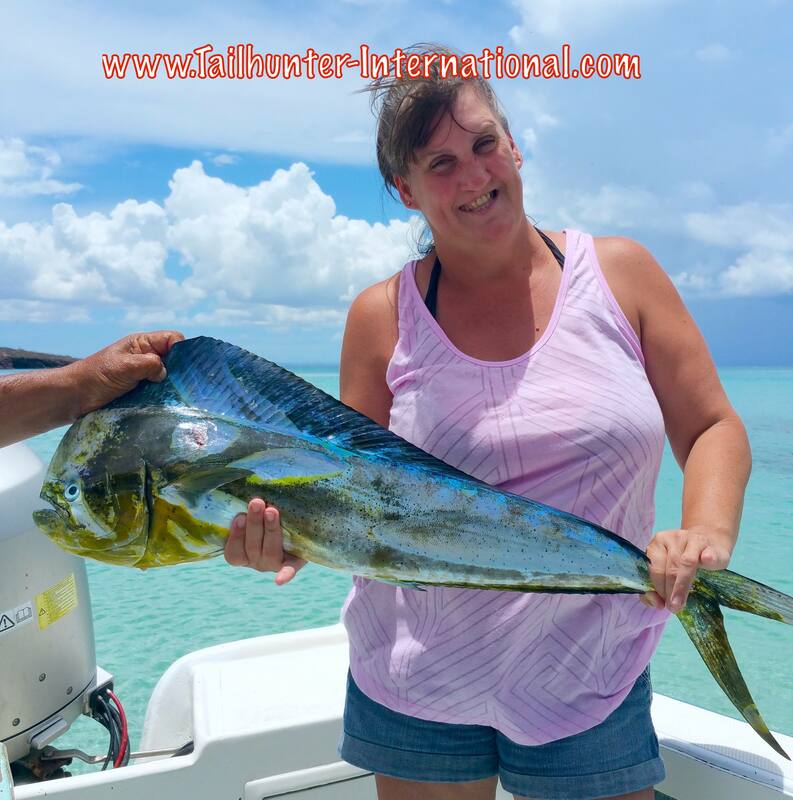 She got this beauty with Captain Pancho and lost an even larger one before this! Big rooster was released. See the video of the catch below. Tyler Vitale (without his shirt) had quite a day. 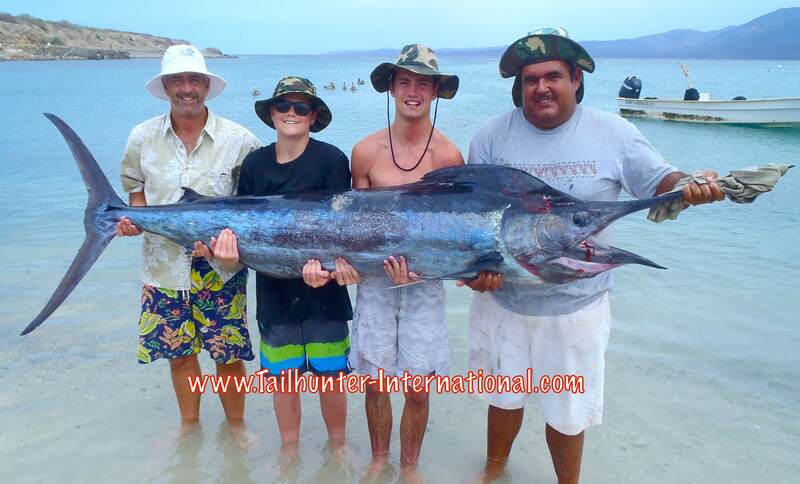 From Escondido CA the eighteen-year-old was just about at the end of his fishing day at Bahia de Los Muertos with brother Brett and dad, Todd, along with Captain Rogelio when he got tagged with this nice blue marlin estimated at 160 pounds! On 60 pound test, he fought the fish for 2 hours! They also caught and released two roosterfish as well. This is just spectacular! Randy Skedgel had an off-the-chart week on the flyrood taking 17 different species of fishing on the flyrod including dorado, roosterfish and on the last day…A WAHOO! Hard enough to do it on conventional tackle, but he knocked it down with a flyrod right off Punta Perrico! 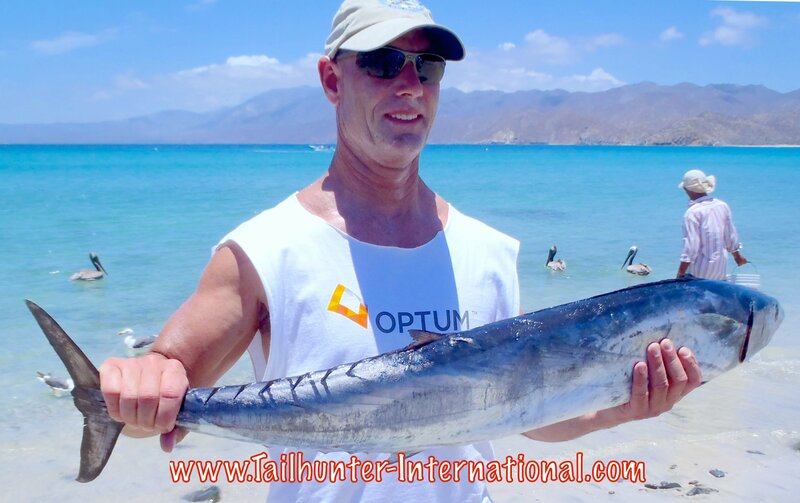 Tom Warbington has fished all over the world. He’s from Georgia and had two fish on his bucket list. One was a roosterfish…we got two of them. Then, he really wanted a striped marlin. He had already caught a blue and a black. So, we sent him off with Captain Chito. Well…he didn’t get a marlin. HE GOT THREE! 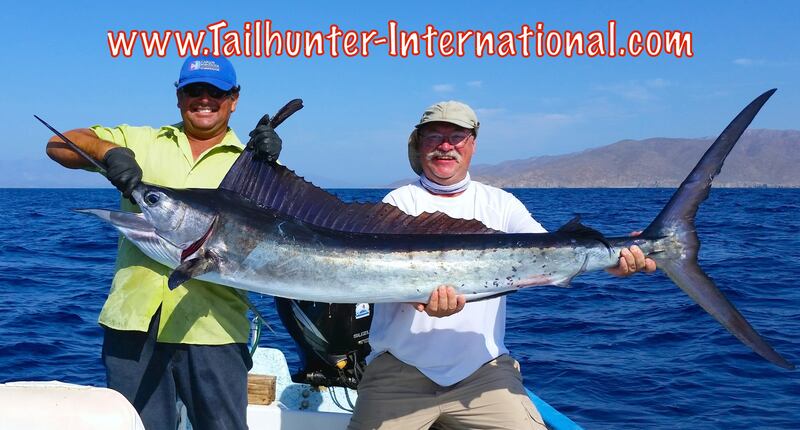 He released two nice striped marlin and kept this estimated 225 pounder. Oregon in the house. First day…first fish! Nicely done . John Titman holds up one of the few wahoo we got this week. Over several days of fishing, John got 10 different species of fish. A really unsual catch! Good amigo, from Temple City CA, Norm Fulco fishes with us 1-2 times a year for many years and on light tackle with Captain Pancho got this very unusual white marlin. Only the 2nd time in all my years here that I’ve seen one. Great eating. You never forget that first one! Danny Morales had never been to Mexico, let alone go fishing, but he gets a thumbs up for his first ever dorado. The first of a number of fish he caught that day. 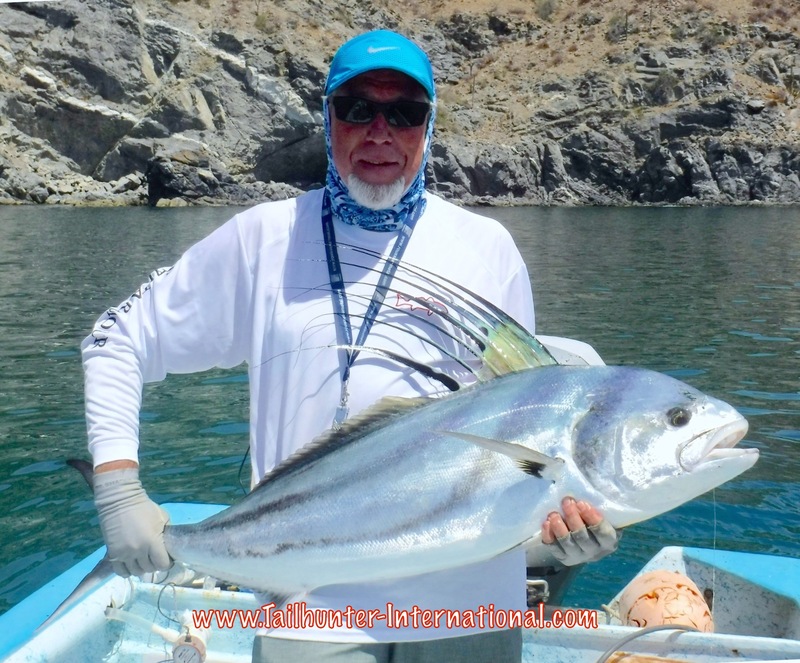 Another of our guys who wanted to target a marlin, Devon Boatman with Captain Raul caught and released a lively striper fishing out’ve La Paz near Espirito Santo Island. Great photo. Nothing wrong with this catch! 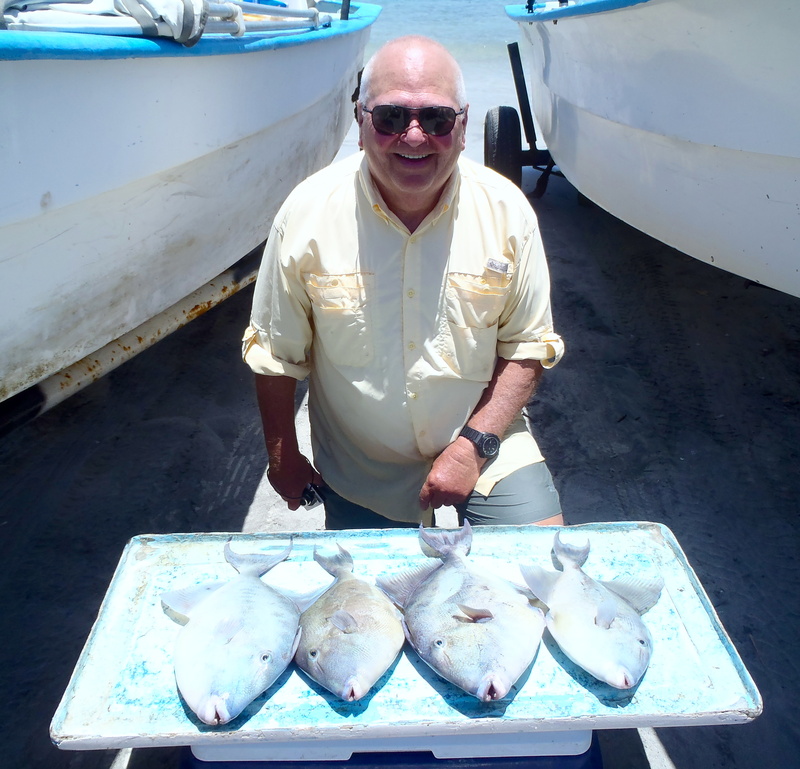 John Ehleres with some HUGE triggerfish he brought back to the Taiilhunter Restaurant and had us whip it into a huge plate of ceviche that he shared with Captain Pancho the next day. We were definitely seeing some better dorado action this week and some better fish like this one taken outside La Paz Bay by Marcelo Llerena. They got a nice limit. Another one on the flyrod for Randy Skedgel who has a huge citrus ranch in central California. Check out the size of the fish and how close to shore he caught it! 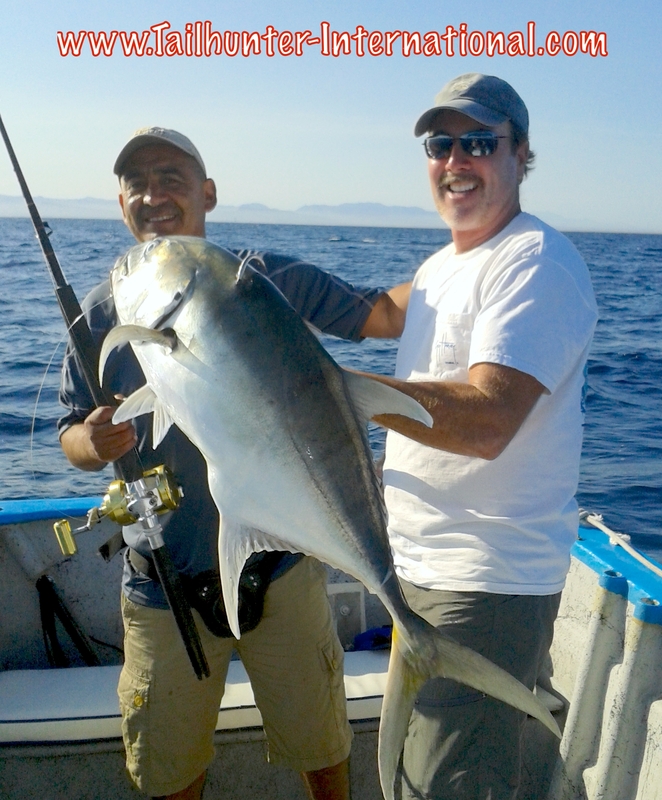 HUGE 30+ pound jack crevalle for our long-time friends from Santa Barbara Bob and Sergio off La Paz Bay. Tough fighter. Good amigos! 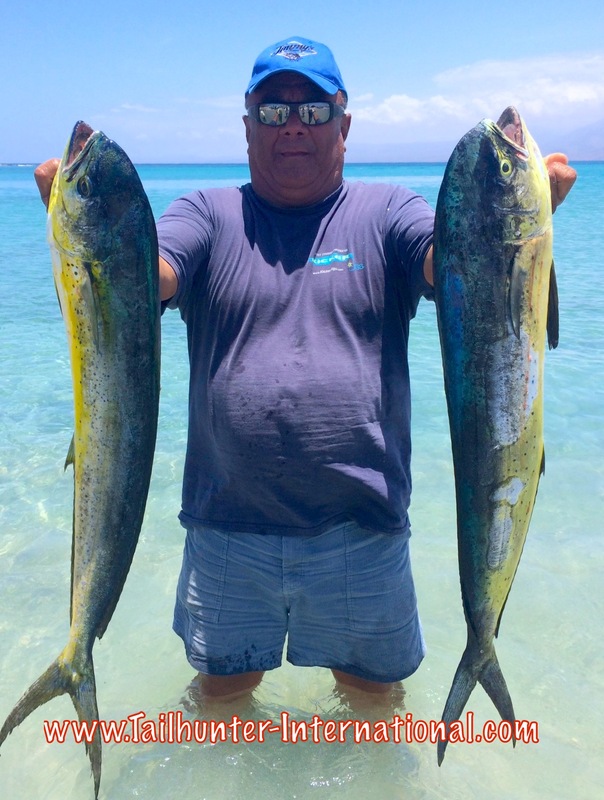 WINDY RUGGED SCRATCHY FISHING BUT MORE DORADO SHOW…FINALLY! It wasn’t an easy week of fishing these past few days. Morning winds generated by some storms to the south and rain to the north put is in the middle of some blustery weather, especially in the mornings. This made for some over-turned greener waters and a tough time getting bait some days. But, even when we had bait, the fish seemed lock-jawed, but the fish were there, but some times just we not eating. Crazy because last week we had the full moon, the fish were on the chew much better. There’s a couple of storms to the south that we’re keeping an eye on to see if they’re developing into something. Once again, big fish or nothing. And there’s fewer bigger fish than smaller fish. So, you got a shot at a big one…or you didn’t. If you lost your fish, well, that might be it for the day. It was a struggle all week. The epic wahoo bite of 2015 seems to have tapered off. There’s still wahoo in the area, but nothing like we had seen. They were hit or miss. We got a few. Lost a few. 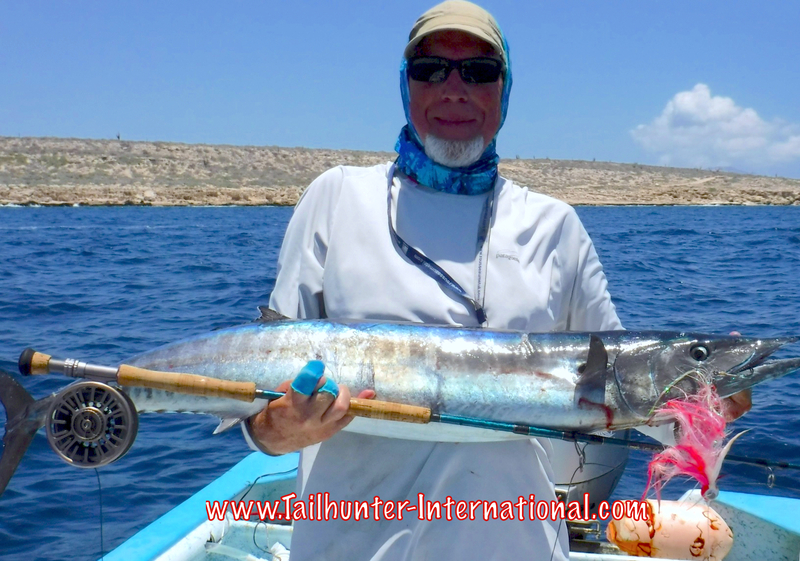 A few weeks ago, every panga was hooked 1-3 or more wahoo per day! This week, we only got a handful. 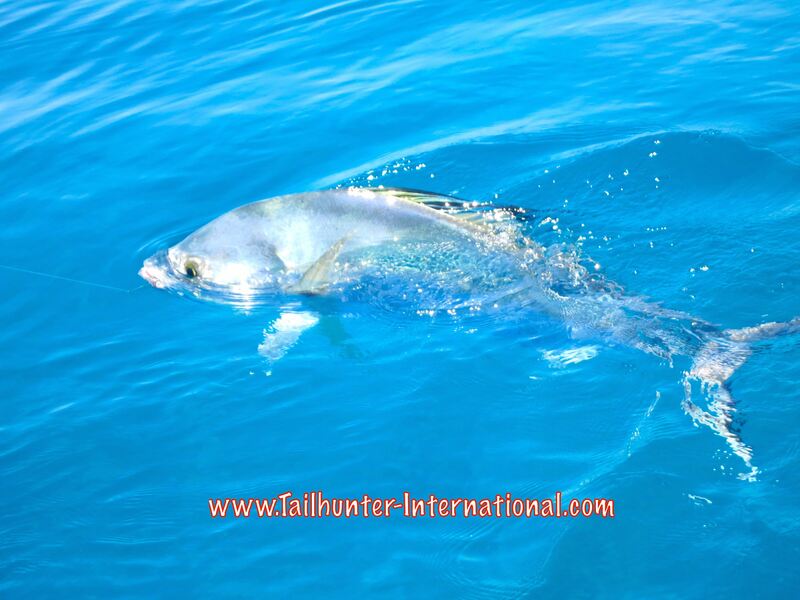 There were a few marlin hooked and lost and inshore small cabrilla and pargo. We get a nice blue at the end of the week (See Tyler’s fish above) and a rare white marlin (See Norm’s photo above). We keep hearing there some breezing tuna outside by the commercial guys, but the fish are fast-movers and don’t stick around long enough to get on them. The best thing we had going were the rooster fish. That’s why they call this “Roosterfish Alley” and the “Roosterfish Capital of the World.” We didn’t get many but the ones we got were the larger 40-60 pound models. And some small schoolie fish as well. 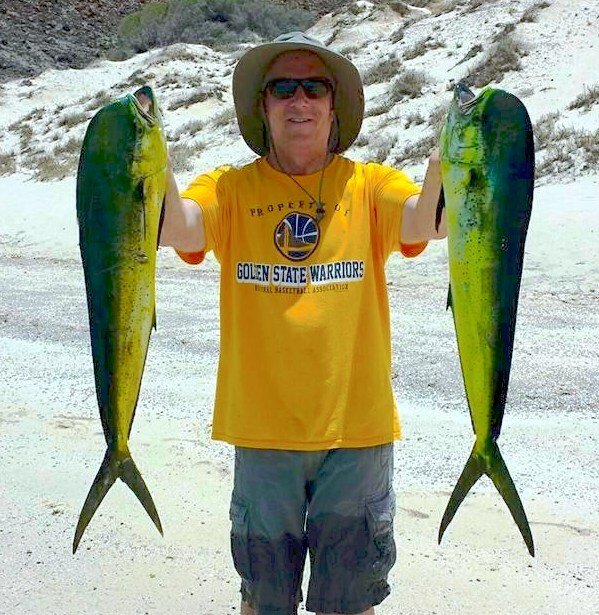 There were a few more dorado around which says alot since we’ve had almost zero dorado out’ve the area all year, but most of the fish are punky 5-10 pound schoolies, but one day they are there and the next they are gone. Should get better. This is where our better action has been. The dorado schools are keeping the rods bent, but this past week was still scratchier than normal. Strong morning winds that didn’t slack off until late morning or early afternoon, didn’t help at all. So, if the bite happened, it was a late bite. The guys really had to work at it and our captains chased and moved constantly looking for the bite. If you found it, hours of boredom were suddenly topped by frantic minutes of madness when the whole school attacked. Some larger fish this week with 15-25 pounders around, but still lots of smaller fish. Hopefully, the bite will get stronger next week because this past week was off it’s game. 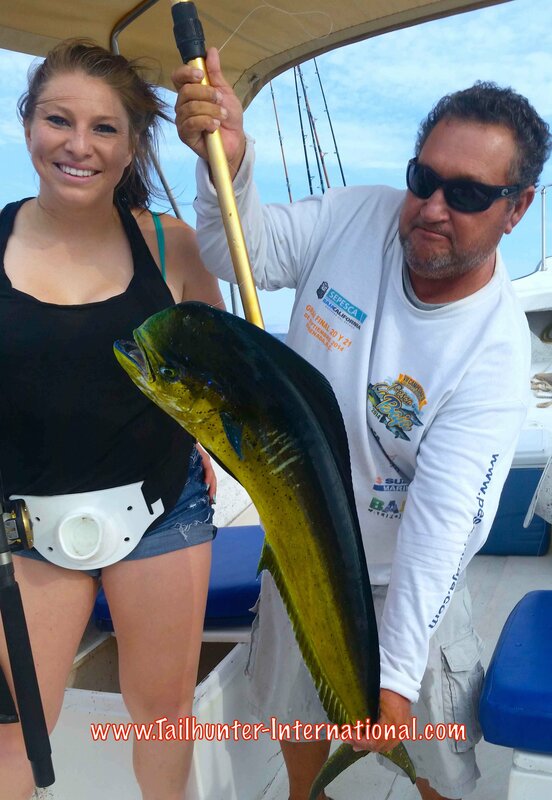 It did seem that late in the week, the dorado got more cooperative with more limits of fish. Inshore, some good spots of cabrilla, pargo and snapper still about and there were a few days when the marlin went nuts and almost every boat had at least one hook up! 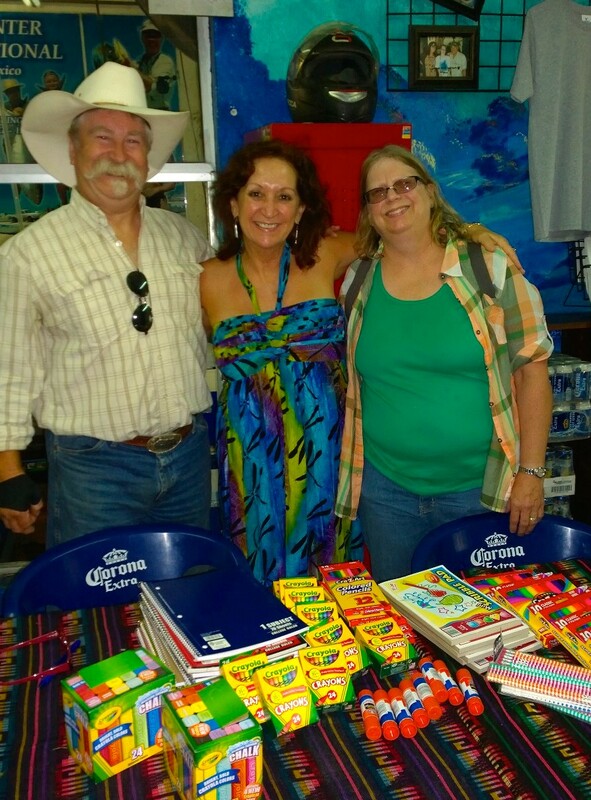 Jilly with Mike “Sir Boy” Kelly and Barry Wood from Orange Co. CA who brought two huge ice chest full of school supplies for the kids! 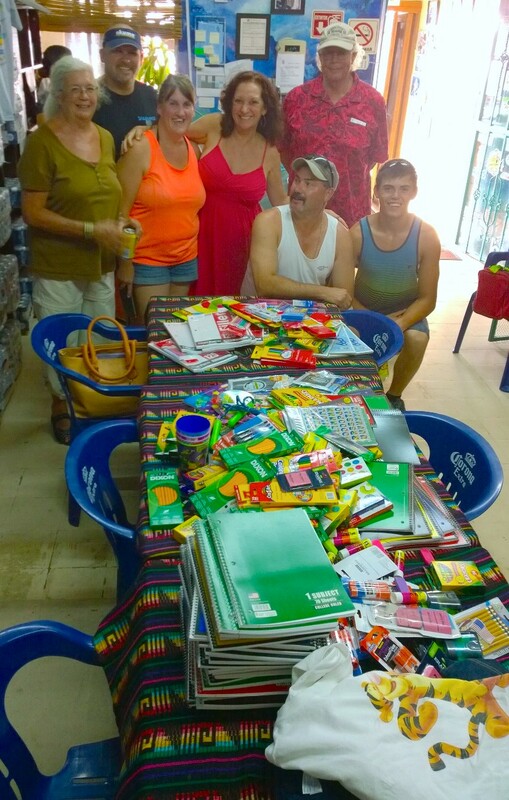 Sam and his wife, Kelly Sybesma are both teachers and came down with a big laod of schools supplies and hygiene products. Jill has a big smile with Sam. Thanks to you both! Since last year, Jill’s program that she instituded called “Pack for a Purpose” whereby angler fill their empty ice chests with things for charity has produced hundreds of pounds of things for the needy especially for the two orphanages and the Women’s Shelter we support. Every week, our anglers with big hearts keep us mindful of our blessings with so many great things for the foundations! Thanks to all! WHOAAA! LAST MINUTE! Just when I was about to write off the awesome wahoo bite of the last 2 months as “over and done,” today Sunday, our guys found the wahoo again! Chris Settevendemie from Paso Robles CA and Captain Archangel might have had some special “help.” He was here at Bahia de los Muertos to spread dad’s ashes. Dad musta been riding along. Chris ripped 3 wahoo today! 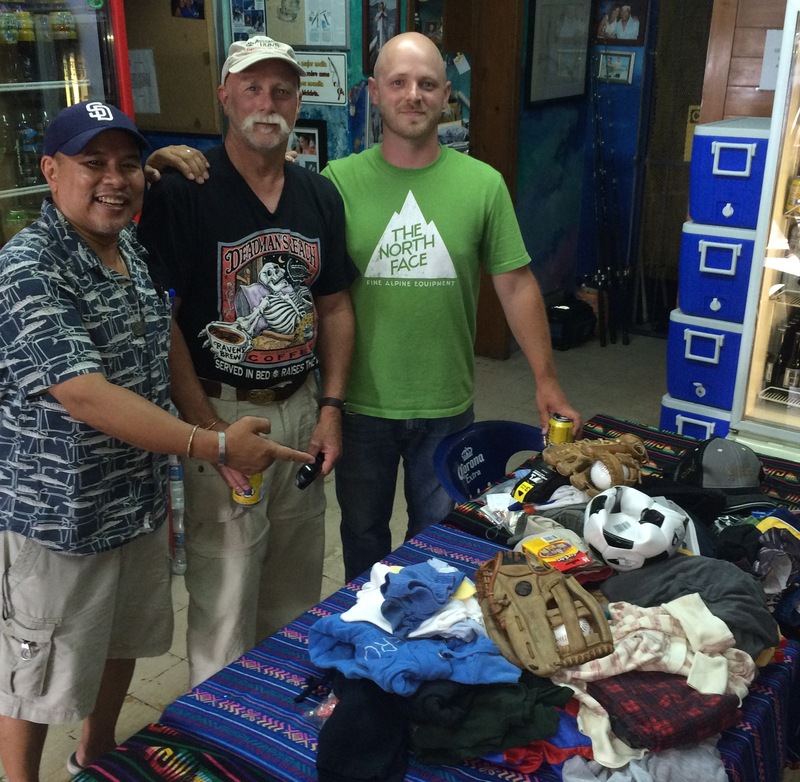 On his first visit here last year, Rusty Cain got caught in the middle of Hurricane Odile last September! He’s back and nailed this gorgeous wahoo today with his wife Caroline just when I thought there were no more wahoo! Great catch just before I put this report to press! 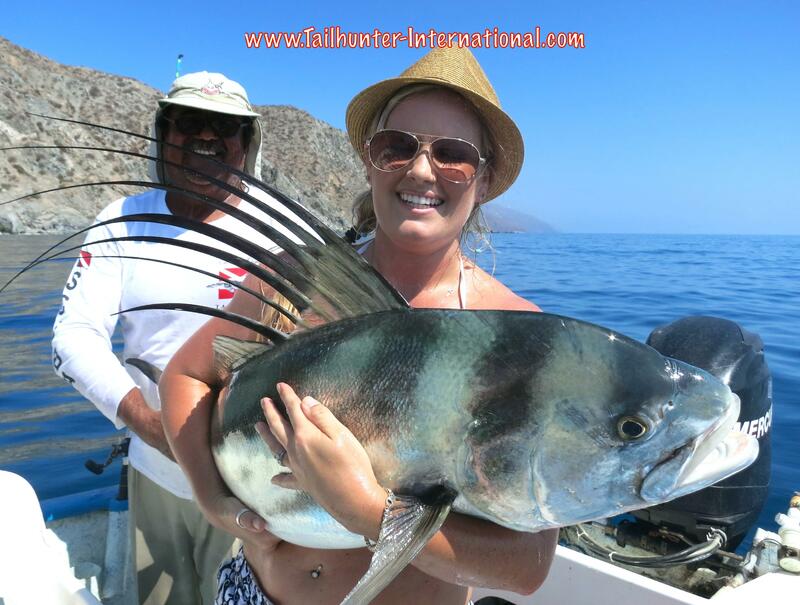 Great roosterfish week and no one had a better one that Alecia and Bennett Clegg from Sacramento CA. In 3 days, they hooked and released 7 up to forty pounds and also lost another 7. Plus they got other fish too! (See below). They were having so much fun, the extended their vacation another 3 nights! Here’s Alecia with another big rooster and Captain Victor smiles on! Retired U.S. Army Sgt. 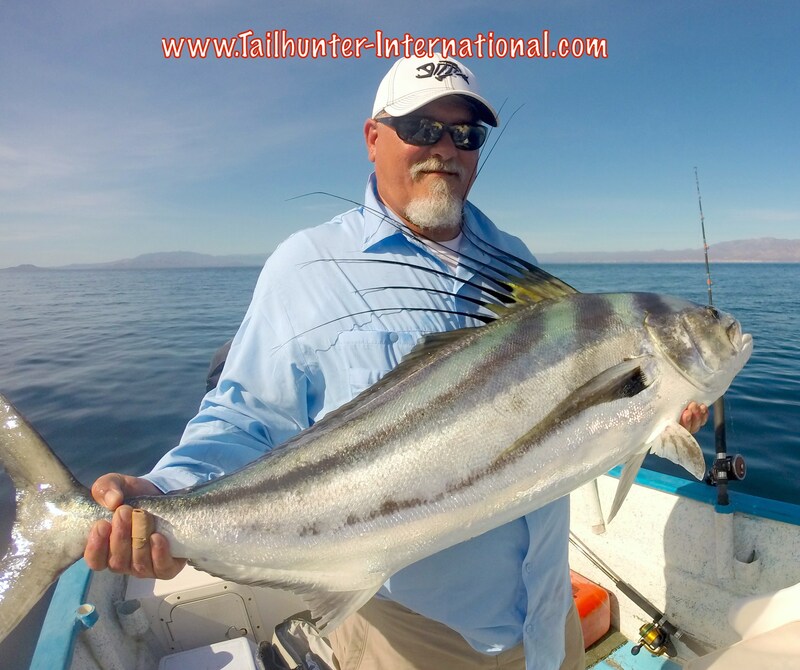 and educator, Tom Rautert from Tucson AZ started his week out right with two of these big roosterfish off Cerralvo Island that tuckered him out a bit more than expected (in a good way!). That’s Cerralvo Island behind him. All fish were released! Despite the full moon, the marlin went pretty crazy this week. Most of the were released when possible. But, in some cases, they were so voracious they charged whatever baits were in the water or whatever lures were out there and fought each other to get at the offering…which also meant they were swallowing hooks and it made it harder to release. First timer from Utah, Dave Gasser had a great week including his first-time striper with Captain Armando! 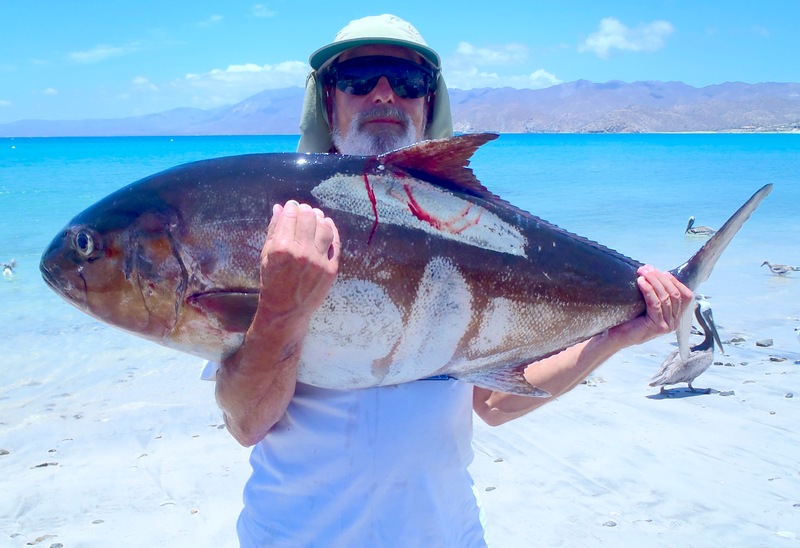 An armload of forty + pound amberjack for Scott Hillier who took this fatty outside of Bahia de Los Muertos with Captain Adolfo driving the boat. 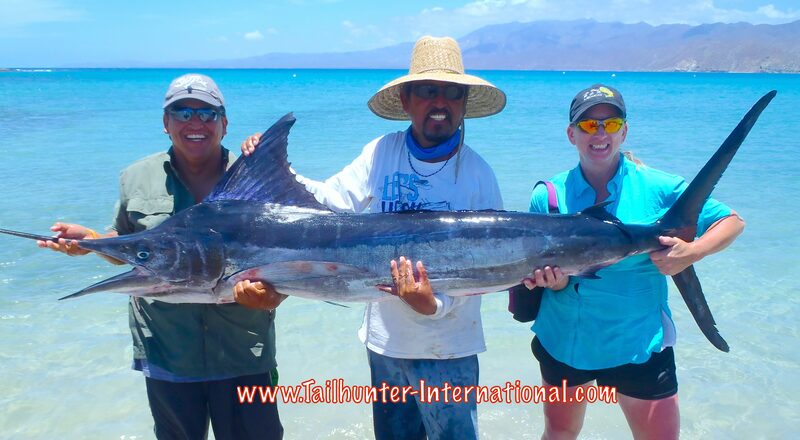 As mentioned above, it was a crazy week with marlin going voracious on the full moon! Diego and Kelly Jimenez from Loveland CO, had a double hookup simultaneously when trying to troll for wahoo! Both lines screaming in opposite directions! 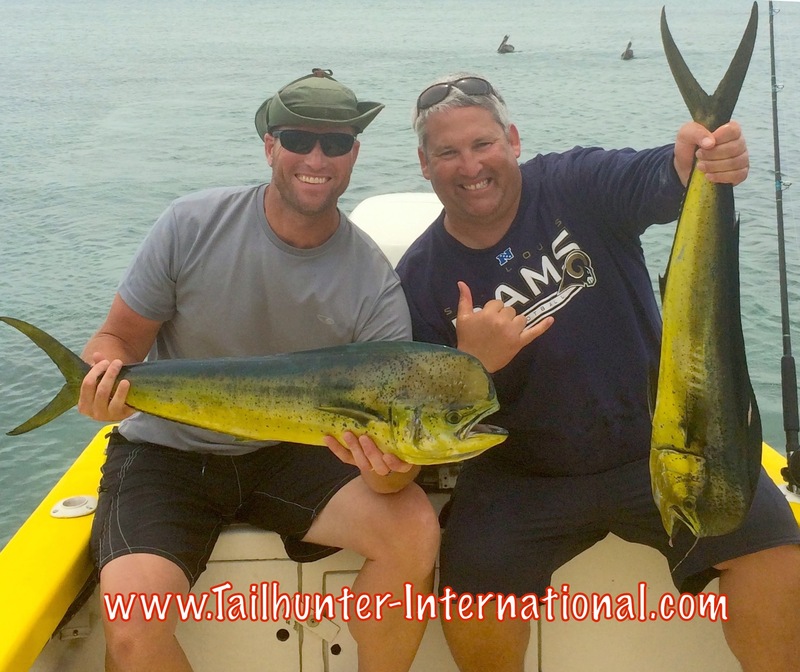 They got both to the boat, but both fish had swallowed the Rapalas with their treble hooks making release impossible. They donated the meat. With Captain Jorge. In addition to a banner week on roosterfish, Bennett Clegg also put a striper in the boat that couldn’t be released. That’s pretty touch to hold up a marlin like that! 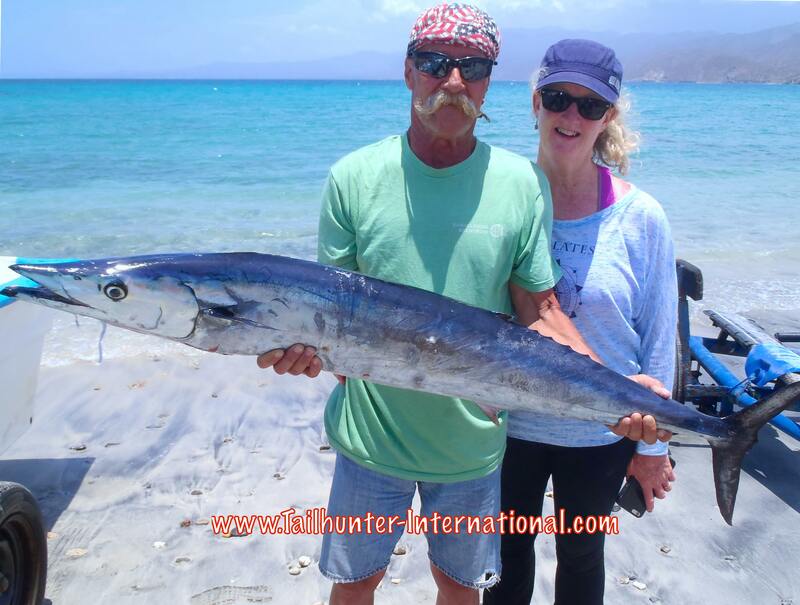 Not many wahoo this week, but Brent Hillier managed to get one landed! Nice fish for our amigo from Colorado! Just a beautiful photo of another rooster before it gets unhooked and released. Pretty water. Pretty fish! Thanks for the shot, Bennett! Beast mode! Another big rooster for Bennett…he got seven of them all released! Check out the flat waters! 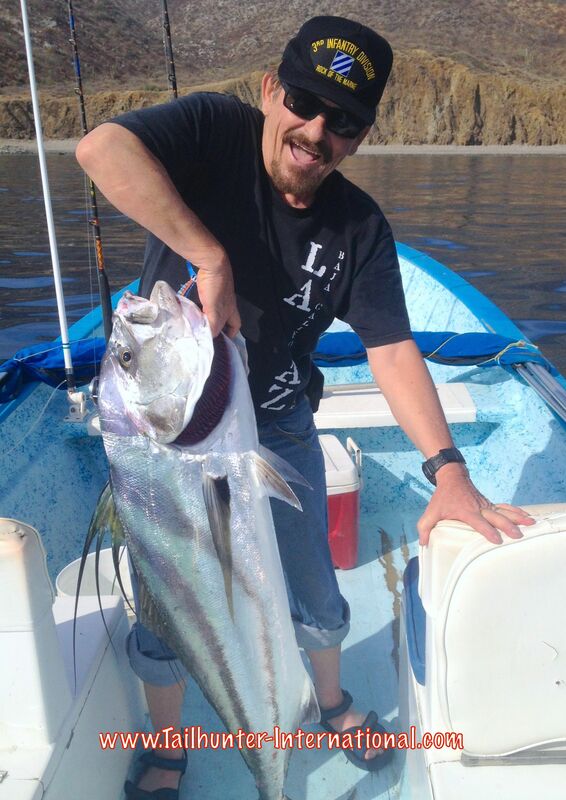 Yes, dorado have been biting, but hardly any for our Las Arenas boats. 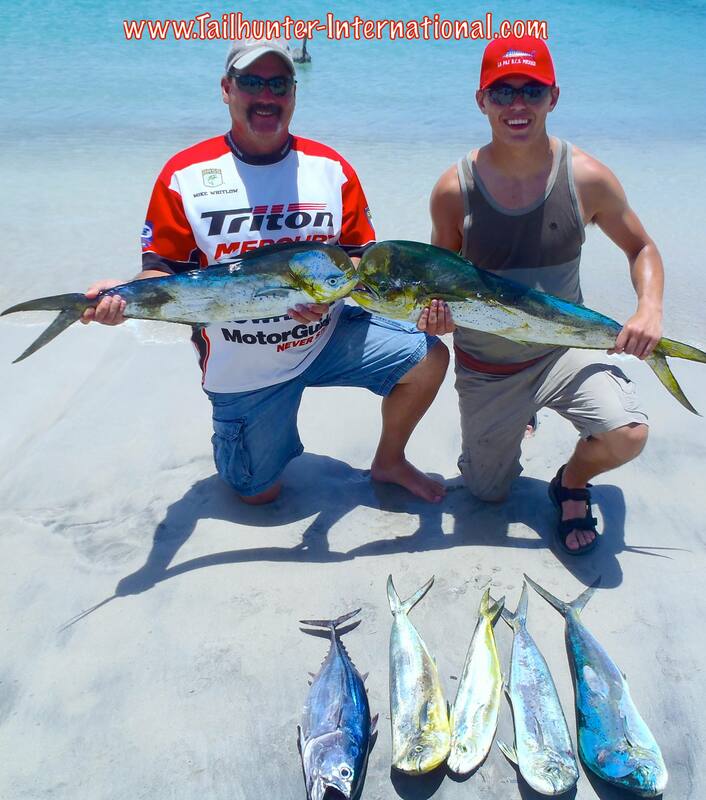 All the dorado have been school-sized fish with our La Paz fleet! Alecia holds up a pretty one. They got near limits. 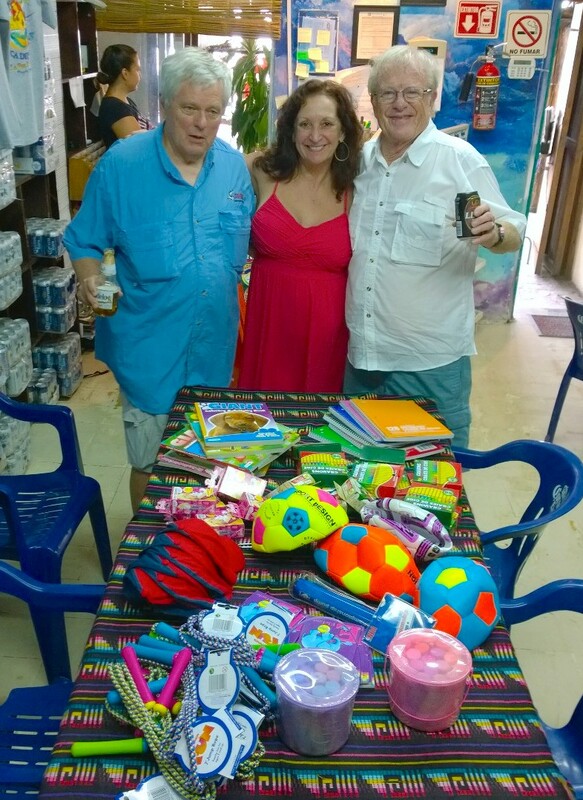 Big shout out gracias to so many of our folks who keep bringing in supplies for our “Pack for a Purpose” program that Jill initiated whereby empty bags and ice chests are brought down but filled with stuff for the kids and families in need at shelters and orphanages. 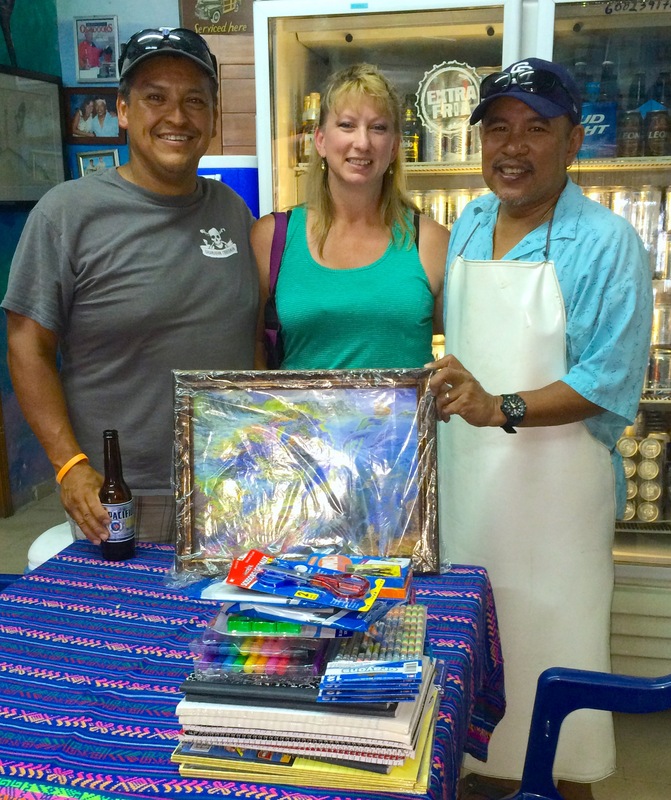 Diego and Kelly Jimenez brought down a bunch of school supplies and also a gorgeous mermaid painting for Jill and I. Big hearts! Sgt. Tom Rautert (ret.) always does it right. 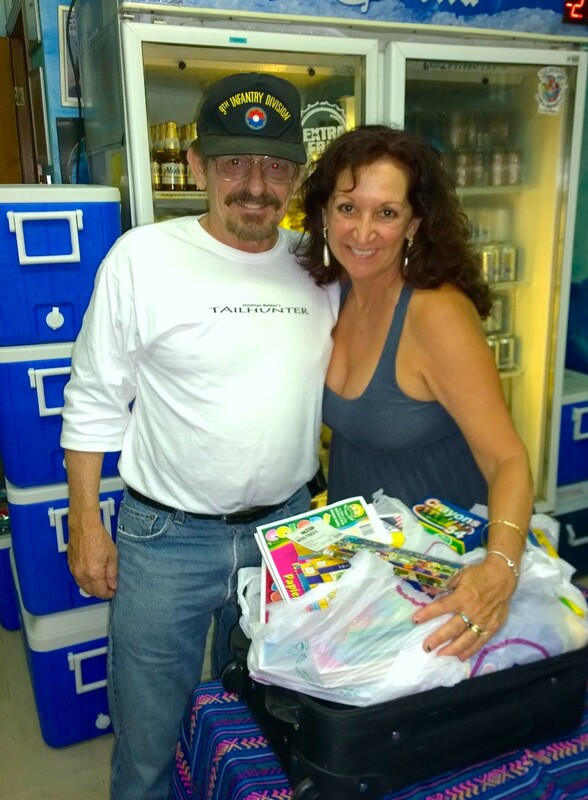 He stuff a suitcase full of kids stuff for our “Pack for a Purpose” program and our veteran poses with Jilly at Tailhunters! Thanks, Tom! FULL MOON BUT ROOSTERFISH AND MARLIN REALLY LIGHT IT UP! 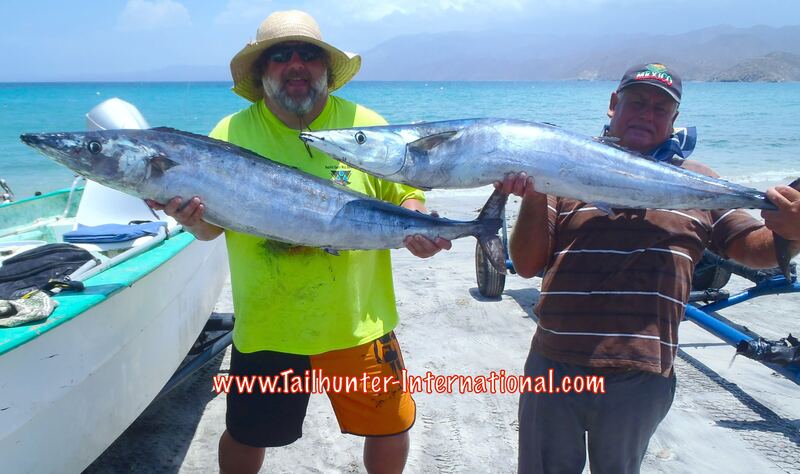 Depending on what you were fishing for and whether you were fishing with our Tailhunter Las Arenas or our La Paz fleet, it was a pretty good week of fishing. Summer is definitely here with hot sunny skies and warm blue waters. Summer vacation has started for the La Paz school kids so it’s a pretty festive time to be here because everyone is out right now! And we also had a full moon that some think adversely affects the fishing. Not this week! 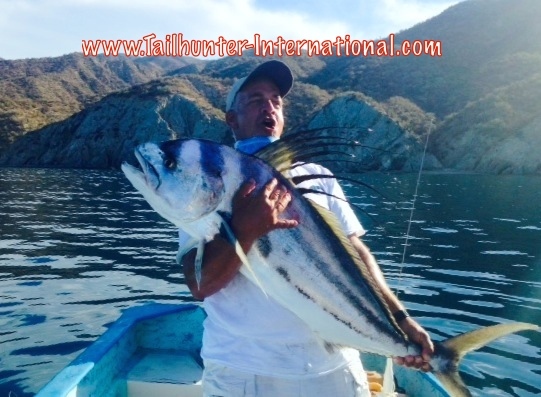 Usually, Las Arenas is where we send our clients to catch variety…get bent…have a little fun close to shore. Everyone catches fish. It’s a good area to start fishing on a fishing vacation. There’s alot of species and lots of live bait to play with. 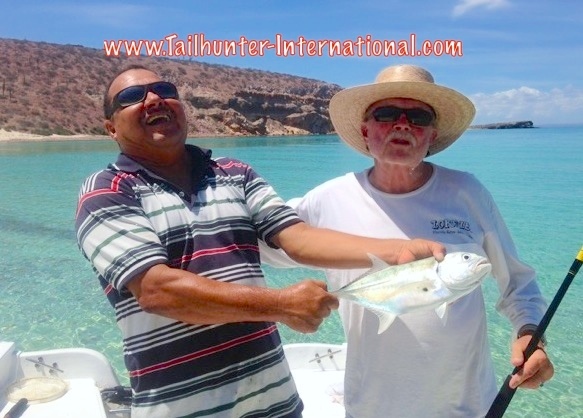 After fishing here and having some fun and putting some fish in the ice chests, then we go fish with our Tailhunter La Paz fleet and look for bigger fish! Well, this year, it seems just the opposite. All the larger fish are at Las Arenas. And there are no “small fish.” Because it’s mostly the larger fish, there are fewer fish. You get one or two shots at at trophy and that might be it for the day. Or one boat might have all the luck on a given day while the boat next to it might get some needlefish, triggers and a bonito. You hit home runs or you strike out. And that’s how it’s been. But, the trophies are NICE! This week the marlin woke up! For many of our folks they got their first shots at billfish and there were several days where each of our pangas hooked at least one marlin. Quite a few lost, but many others were caught and released. The problem is that it’s like the marlin woke up from a Rip Van Winkle Sleep! They are voracious! Guys have told me the marlin were everywhere and swimming around the pangas. They are actually trying to get away from them. The fish are charging just about any bait or lure in the water without hesitation and even fighting each other to get to a bait or lure. The problem with that is they we found the fish are literally swallowing everything WHOLE! That makes it tough to release when hooks and lures are so deep! One of our guys even told me that his hat blew into the water and as it blew away a marlin swirled on it! Likewise, the rooster fish have been on fire! 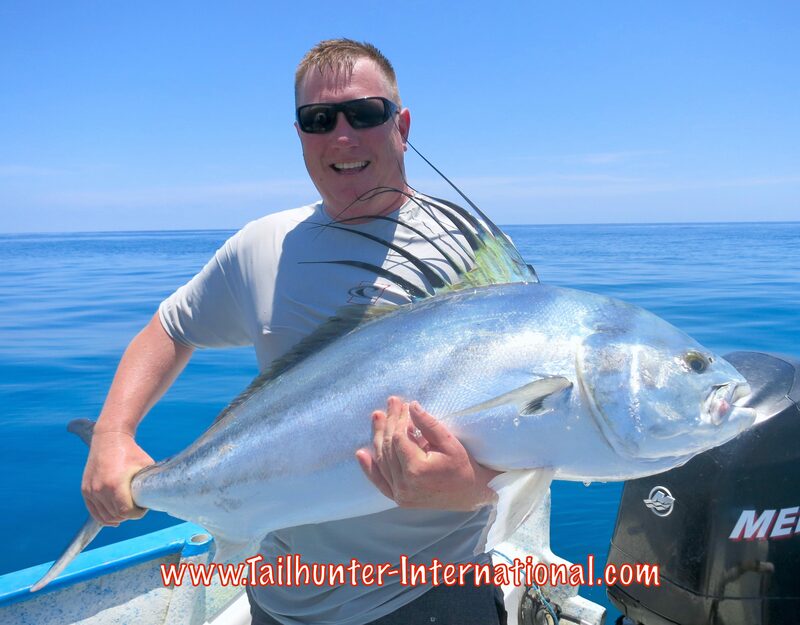 Not uncommon to hit 2, 3, 4 or 5 roosters in the 20-50 pound class each day with all fish being released. It seems the full moon turned them on also. Around Punta Arenas and on the south eastern side of Cerralvo there are some hot spots. 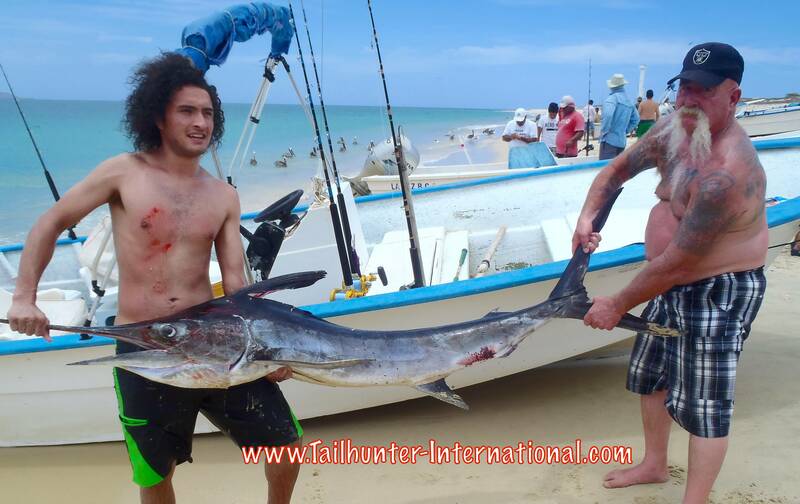 There’s also some wahoo still around and we’ve taken a few fat amberjack and pargo too. However, I think our incredible epic wahoo bite that we enjoyed the last two months may have finally run it’s course! It had to end sometime…darnit! The past week or so only a smidgen of wahoo even biting. 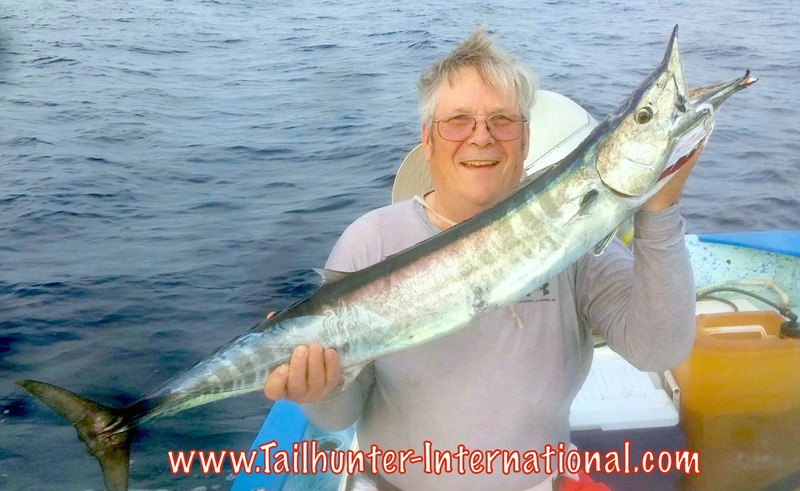 HOLD EVERYTHING...just as I’m putting the finishing touches on my Sunday night fishing report, our Las Arenas boats come in from the day…AND THEY HAVE WAHOO! One panga had THREE (See above photos). One had another wahoo and another lost a wahoo. So, maybe all is not lost! WAHOO! Normally, this is the “big fish area” as mentioned above. However, the last few weeks, this has turned into the “action zone.” Dorado have finally come around nicely. Lots of little fish, but some larger 15-20 pounders now showing up and not unusual to get limits or near limits daily. Marlin and sails are in the same areas as the dorado since they are eating the smaller dorado plus quite a few sharks hooked as well. Inshore, cabrilla and pargo and big snapper as well as rooster fish have made for some nice variety.